RoyaltyClaim is an information service offering music rights-holders an actionable database of unclaimed music entitlements from royalty collection sources from around the world. 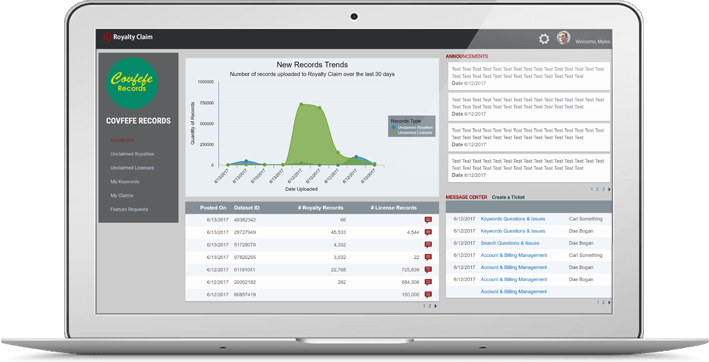 View data import trends right on your dashboard. Statistics on recent imports of unclaimed royalties and music license records provide context around the music licensing ecosystem. Read our public comments and analysis on specific datasets to stay informed. Receive notifications and send us messages directly from your dashboard. 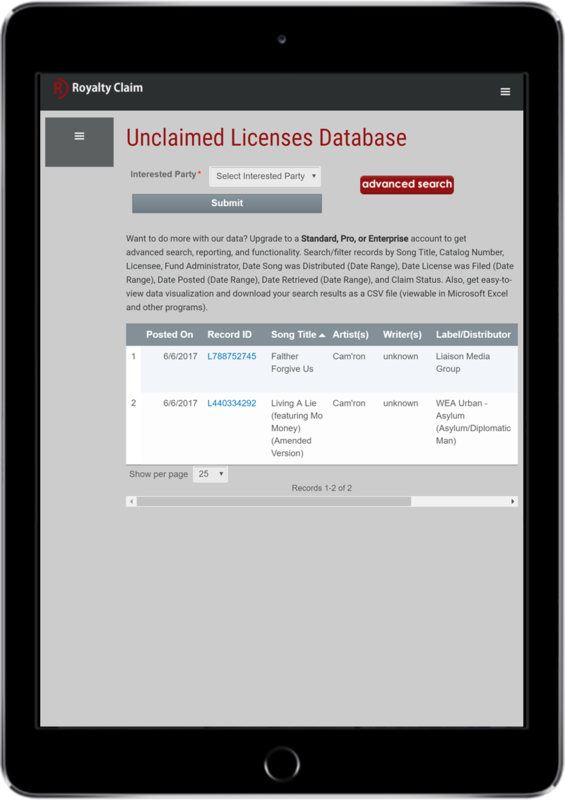 Explore our ever-growing databases of unclaimed music entitlements. Search by Interested Party (Writer, Publisher, Artist, Label, Distributor, and Other Income Participant). Get step-by-step instructions on where and how to claim your entitlements. Create and manage keywords used to search across the RoyaltyClaim databases. 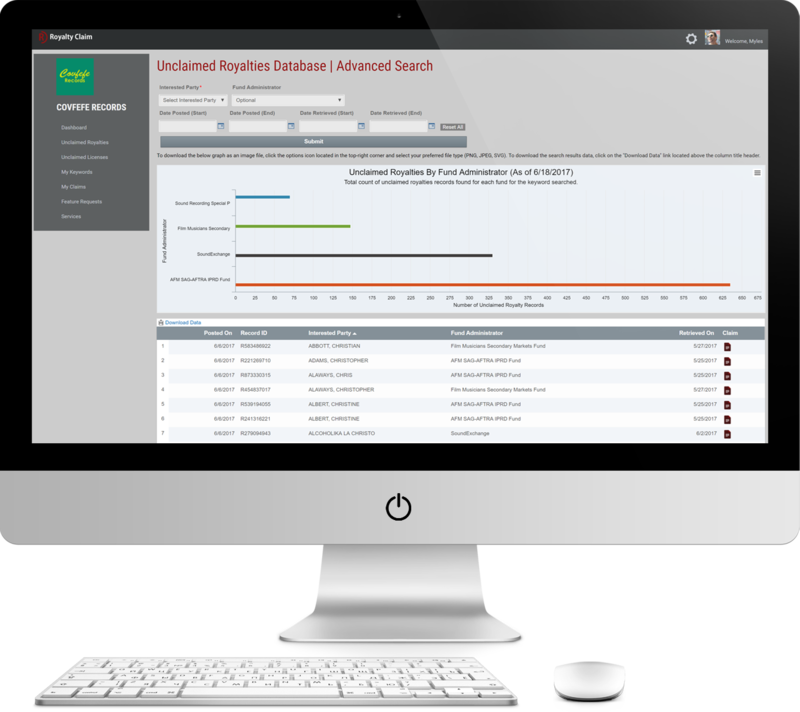 Utilize advanced features to power-search our databases and quickly find your entitlements with better filtering. Plans with access to Advanced Features also include all Core Features. Search by Interested Party (Writer, Publisher, Artist, Label, Other Income Participants), Fund Administrator, Claim Status, Date Posted, and Date Retrieved. Export search results as CSV file. Print and download data visualizations as PNG, JPEG, and SVG files. Keywords enable users to search RoyaltyClaim databases. A keyword could be a person, group/ensemble, company, or song title (depending on if your plan has access to Core or Advanced features). For example, "Stefani Joanne Angelina Germanotta" and "Lady Gaga" refer to the same individual, but those are two distinct keywords in our system and could be used to search and find different types of records. Therefore, the FREE plan would be sufficient to search our records since the FREE plan includes 2 keywords. However, the band Maroon 5 would need the BASIC plan, which includes 10 keywords, because the band name "Maroon 5" is 1 keyword and they would require 5 more keywords for each of the band members' real names (6 total keywords). Keywords can be edited once every billing cycle. To receive more keywords, plans can be upgraded at any time.